Have you ever wondered what happens to adventurers when they decide to stop raiding temples and locating lost gold? After spending years honing their instincts and learning to wield deadly weapons what do they do when there are no more creatures left to slay or monsters left to hunt? They probably do something goddamn fabulous. Something like this! Pictured: Two Weapon Rend in action. That picture is not a joke; it's a shot of stylist Nguyen Hoang Hung doing what he does best. 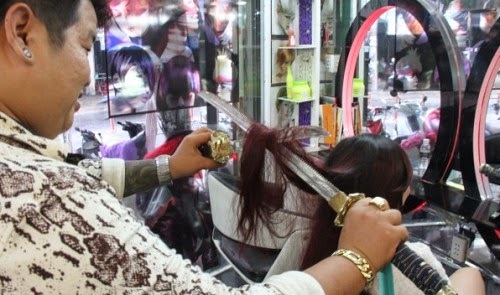 This hairdresser, who works in the Thanh Ke district in Da Nang according to this source, has tossed aside shears and scissors in favor of sculpting his client's manes with more epic tools. What he did before becoming a samurai stylist is not certain, but there has been a noted dearth of dragons in Vietnam for many years. Just saying. If you want to see this man in action check out the video below. Would you be brave enough to let him sharpen up your look? As always thanks for stopping by Improved Initiative, and if you'd like to help support the blog stop by my Patreon account and become a patron today! If you want to make sure you don't miss any of my updates then submit your email to the box on the right, or follow me on Facebook and Tumblr!